The cubozoan bell is square in horizontal cross section. Inside the bell are the manubrium and mouth. A flap of tissue called the velarium is located along the underside of the bell. Muscular fleshy pads called pedalia are located at the corners of the bell. One or more tentacles are connected to each pedalium. Actually, that's the way to tell apart the two main groups of cubozoans (Chirodropidae and Carybdeidae). Carybdeids always have one tentacle per pedalium, while chirodropids have multiple tentacles attached to each pedalium. Take the test? Like other cnidarians, cubozoans are composed of two layers of cells, ectoderm and endoderm. The gut, or stomach cavity, is partitioned by septa and extends to the tentacles through pedalial canals. 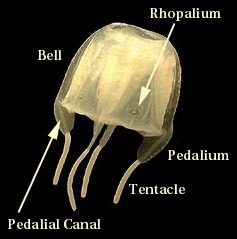 On the bell, located midway between the pedalia, are four sensory structures called rhopalia. If you take a close look inside the rhopaliar niche of a cubozoan (left), you'll see a remarkable thing . . . . looking back at you. That's right, cubozoans have eyes, and surprisingly complex ones at that. In this close-up of a rhopalium (right), you can see six reddish spots, all of which are sensitive to light. The four smallest spots are relatively simple. However, the two larger regions actually contain lenses, corneas, and retinas, not so unlike those in your eyes. It is still unclear how the images created by these lenses are interpreted by cubozoans since they do not have brains. A cubozoan can look both inward towards its mouth and manubrium and outward since each rhopalium dangles by a muscular stalk. Inside each rhopalium, located below the eyes, is an organ called a statocyst. Inside each statocyst is a hard nodule composed of calcium sulfate, the statolith. Statoliths appear to have daily growth rings. The statocysts are sensitive to orientation, and thus allow cubozoans to sense whether they are upside-down, sideways, or rightside-up. Like all cnidarians, cubozoans are endowed with nematocysts, cells that fire a barb and transfer venom. As you can see to the right, the barb is coiled up inside a capsule. 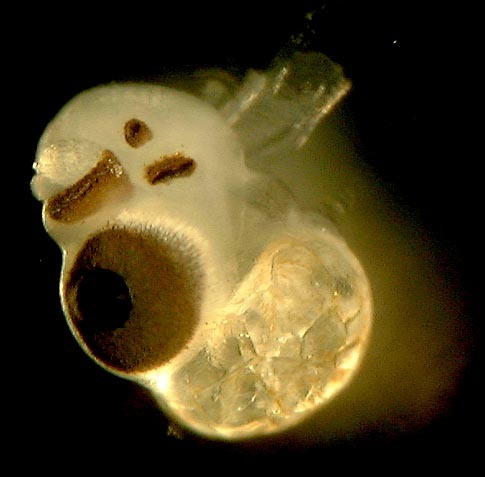 When a nematocyst touches something that might be prey or predator, the barb uncoils and fires from the capsule along with venom. Nematocysts are concentrated in rings (right) on the tentacles of cubozoans. This makes sense. When the tentacles capture a prey item, they contract, and the rings allow for maximum contact and transfer of venom between nematocyst and prey. 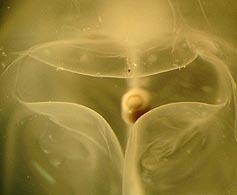 In some cubozoans, such as Chironex fleckeri, nematocysts are absent from the bell. Unfortunately, we do not have (yet) any good pictures of cubozoan larvae or polyps. These stages are not very well known in cubozoans. In fact, it was not until about 1970 that the complete life cycle of a cubozoan was observed. The cnidarian larva is called a planula. Cubozoan planulae are pear-shaped (that's "pyriform" in scientist lingo), have pigment spots which may be sensitive to light, and swim for a few days using cilia. After a planula settles, it grows into a polyp. The cubozoan polyp can crawl around like an inchworm and bud off more polyps. Its form is relatively simple. It has a mouth surrounded by up to 24 tentacles. The polyps do not closely resemble the polyps of scyphozoans. These differences may indicate that cubozoans have a separate evolutionary origin from scyphozoans. Finally, it is worth mentioning in case you go on to read more about cubozoans (or any other cnidarians for that matter) that the plains of symmetry in a cubozoan have special names. The interradii are marked by the pedalia; rhopalia occur along the perradii. Larson, R. J. 1976. Cubomedusae: Feeding - functional morphology, behavior and phylogenetic position. in Coelenterate Ecology and Behavior, Mackie, G. O. ed., Plenum Press, New York. Pearse, John S. and Vicki B. Pearse. 1978. Vision in cubomedusan jellyfishes. Science, 199: 458. Ueno, S., Imai, C. & Mitsutani, A. 1997. Statolith formation and increment in Carybdea rastoni Haacke, 1886 (Scyphozoa: Cubomedusae): evidence of synchronization with semilunar rhythms. Proceedings of the 6th International Conference on Coelenterate Biology 1995, 491-496. Werner, B., Cutress, C. E. & Studebaker, J. P. 1971. Life cycle of Tripedalia cystophora Conant (Cubomedusae). Nature 232: 582-583.